Remember my previous Halloween nails? Well, I decided that they could use a little more something - glitter! So I decided to glitterify them to my heart's delight! Halloween Manicure: Neon, glitter and stripes! I happened to buy a bottle of China Glaze Glitz Bitz 'n Pieces from Beauty Asia 2013 earlier this year, so I thought that would do it perfectly for glittering up my existing manicure. 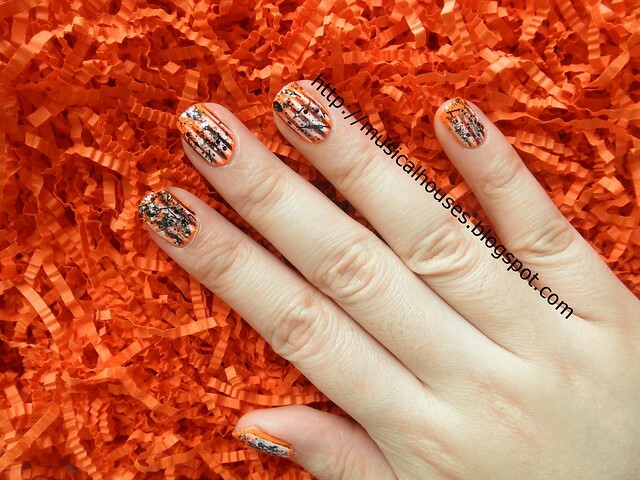 Halloween nails: Neon orange, glitter and stripe designs. The thing is, I'm not sure if I love the result more than the original. I have mixed feelings about it. For one, the glitter I layered over it, China Glaze Glitz Bitz 'n Pieces was really dense. Now this is a good thing, because I haaaate fishing for glitter. Except just in this one case, because it was easy to overdose on the glitter and cover your entire nail. I'm not sure if the glitter obscured the stripey nail art underneath it or not. Halloween nails: Neon orange, and a lot of glitter! I'm not sure whether the glitter is distracting from the rest of the design. What do you think? I don't think it's terrible (there are gaudier, louder nail looks out there for sure), but maybe if I layered Glitz Bitz 'n Pieces over a plain orange base, it would look better. But I didn't, because I was lazy and didn't want to take off my previous manicure. You can recycle your mani by adding glitter, they said. It will be awesome, they said. Anyway, Glitz Bitz 'n Pieces was pretty easy to apply, given the denseness of the glitter. No fishing required, no awkward dabbing application that makes your polish bubble. You can pretty much apply it normally. The base, in case you were too lazy to read my previous post, is Illamasqua Gamma, a really lovely neon orange, while the stripes were freehanded with a striping brush using Illamasqua Baptiste for the purple stripes, and a random LA Colors striper for the white stripes. 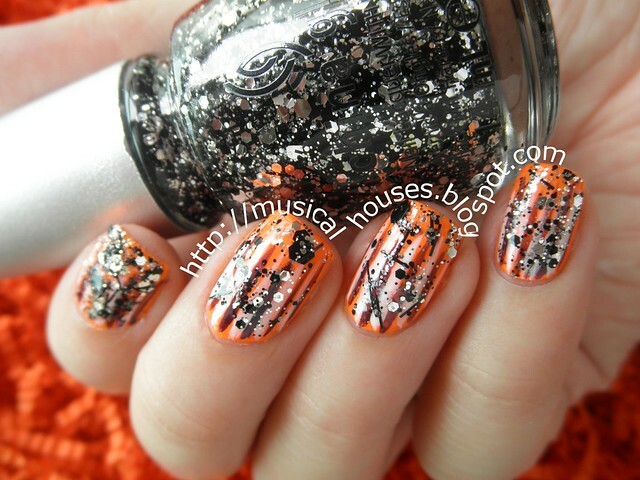 Halloween nails: Orange-glitter-stripey-blingy overdose-y fun! And just one last photo, because I had a good nail day. My nails are quite possibly the longest they've been in awhile now, and that makes me happy. I know it's not SUPER LONG, and some of the nail bloggers with inhuman genetics would call my nails nubbins, but it's been three years since I could barely grow my nails past the tips of my fingers without them breaking. Now they're just starting to cross that threshold, and I feel so accomplished looking at them, LOL. Halloween nail art: Easy to do, blingy and awesome to look at. Anyway, that completes my Halloween manicure for this month! I know it's not as cool as some of my previous nails (starry, scar-y, purple, and a cobweb design that was freehand and not all that great), but I think it's a good way to get blingy, without necessarily having to splatter your nails with "blood" paint (which was exactly what I did last year for these bloody-looking Halloween nails. OMG!!! This mani is so pretty. I would love to try it this Halloween for I will be attending a party. thanks for sharing.